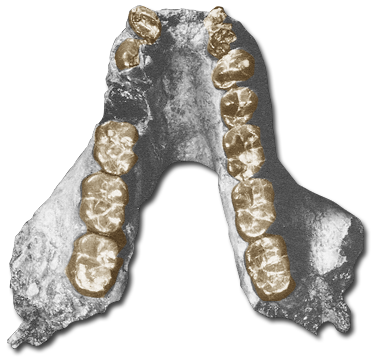 Gigantopithecus is represented by two species: G. giganteus and G. blacki. German paleontologist Ralph von Koenigswald purchased a set of massive primate molars in a Hong Kong drug store in 1935. He soon dubbed these remains Gigantopithecus. According to Stanford, et al., “Gigantopithecus was the largest primate (660lbs) to have ever lived and legend of the yeti and sasquatch can be traced to Gigantopithecus. According to dental morphology, tough fibers most likely bamboo were a staple of the diet.” Unlike most primates the incisors of this genus are reduced to grinding instruments. Massive dental and gnathic morphology with large premolars compared to the smaller molars (Hartwig). 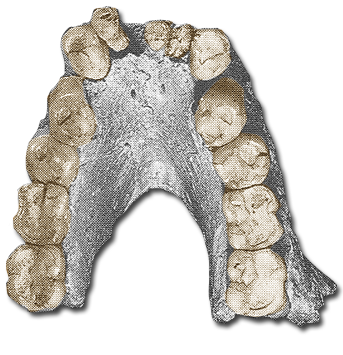 Gigantopithecus blacki has a more massive dental and gnathic morphology than G. giganteus. 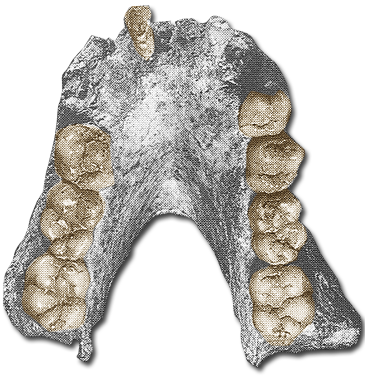 G. blacki is estimated by faunal remains to be 0.5 – 0.75 myo and was possibly contemporaneous with Homo erectus (Pilbeam).